Originally all the glass windows were plain. Only two stained glass windows have been added since 1905. My soul hath a desire and a longing to enter into the Courts of the Lord, Ps: 84.2. It was actually unveiled on 7th January 1923 by the Rev F Kennen, former vicar. In the bottom right-hand corner of the Parkin window is a tiny golden lion, winged and nimbed, holding a Bible in its front paws. This is the mark of stained glass manufacturers George Frederick Gascoigne & Sons, Shakespeare Street, Nottingham. The Parkin window was designed by Alexander Gascoigne who was trained at Nottingham School of Art and on the Continent. 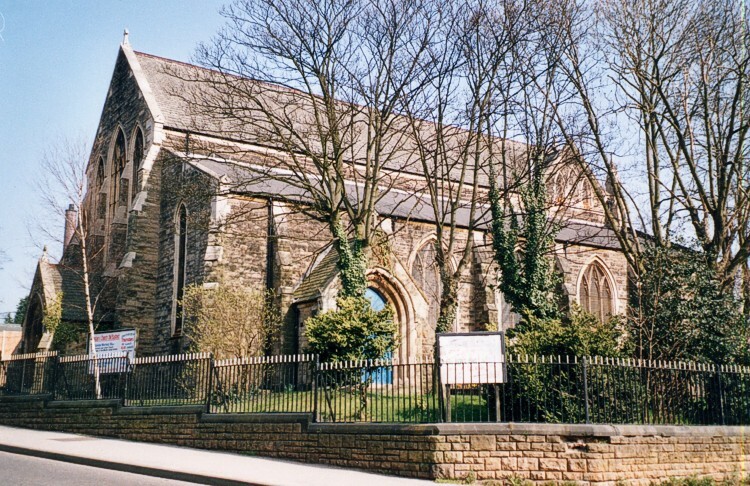 He knew and had worked with Horace T Hincks of the Nottingham firm of Hinchcliff, Hincks and Burnell Ltd., who later designed the Hutchinson window for St Aidan’s. and was presented by Mrs. Hutchinson for her husband, for many years a sidesman at St Aidan’s. 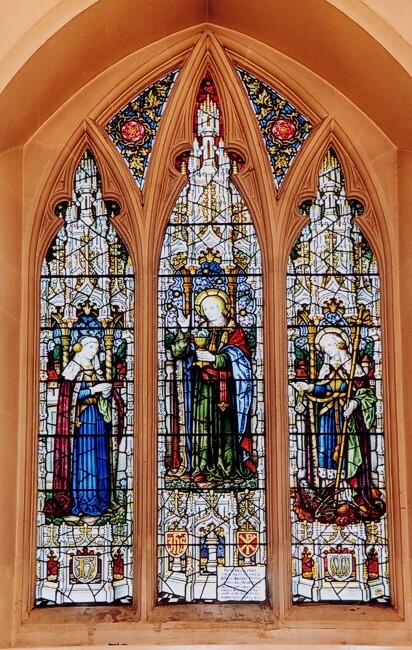 The window was made by Hinchcliff, Hincks and Burnell Ltd. of Nottingham, and the design was approved by Joseph Else, the Principal of the Nottingham School of Art. 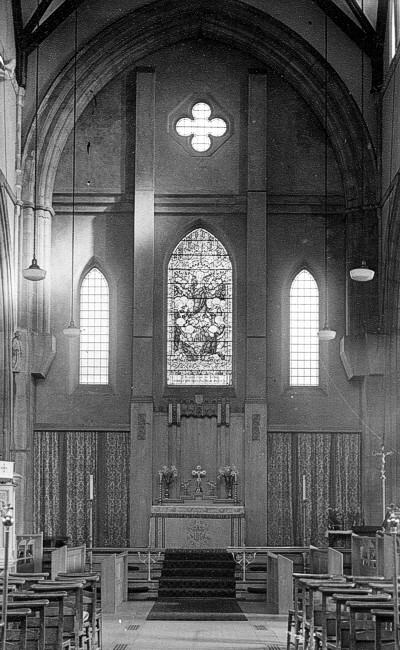 The arrangement of the east wall was completed by a plain lancet window on either side of the Hutchinson window and, high up, a plain quatrefoil window. 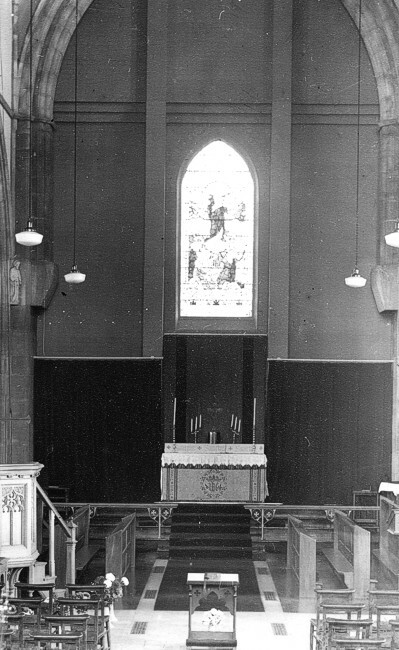 These were all removed in the general re-arrangement in the mid-1960s, when the Hutchinson window was inserted in the Side Chapel, above the reredos.